Update 2013. Values are in Euro. This coin where minted over 20 Cents 1894 and 1895 of Umberto I. 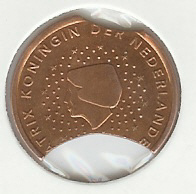 In some coins is still possible to see the previous coin. It is possible to see an exemple in this page.